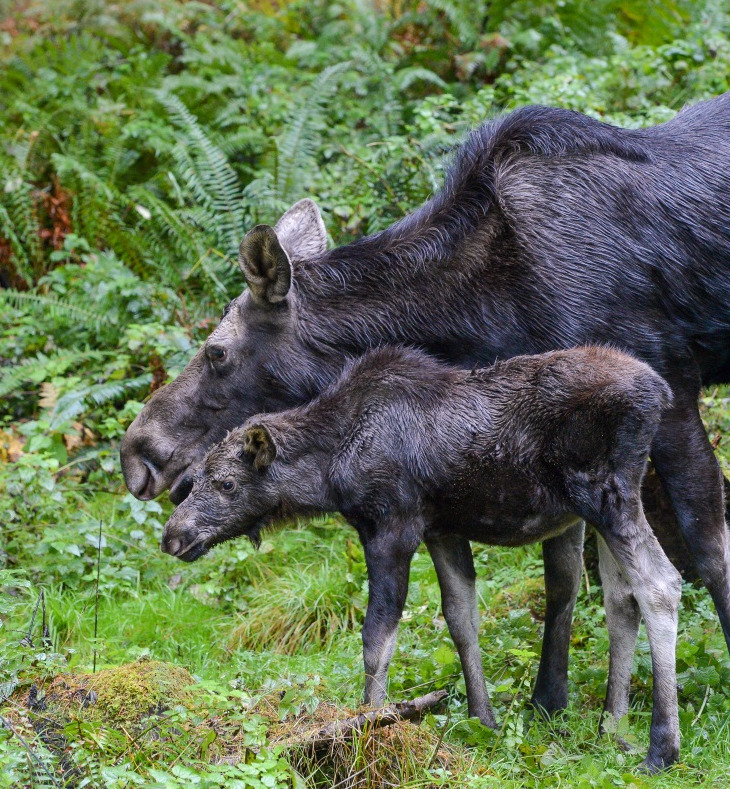 Northwest Trek Wildlife Park in Eatonville, long a popular destination for wildlife viewing and family fun, will soon add a huge new enticement for its visitors, especially the young ones. 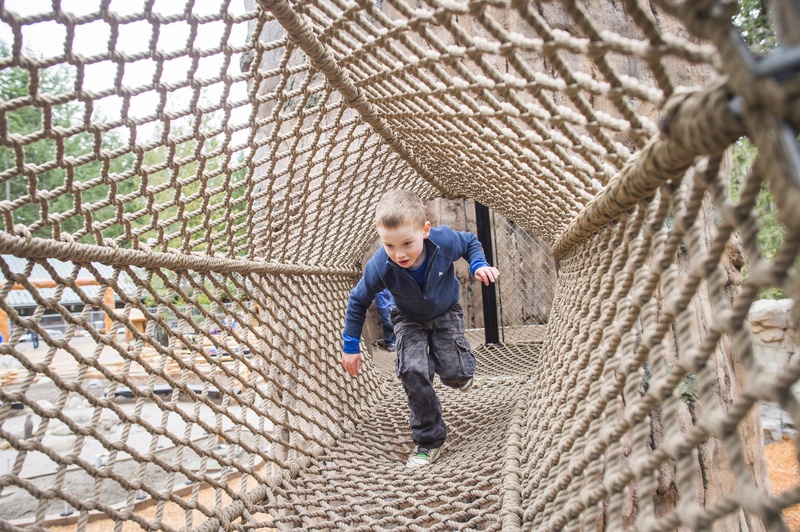 Kids' Trek, a half-acre adventure playground for children and families, opens Saturday, April 2, 2016. 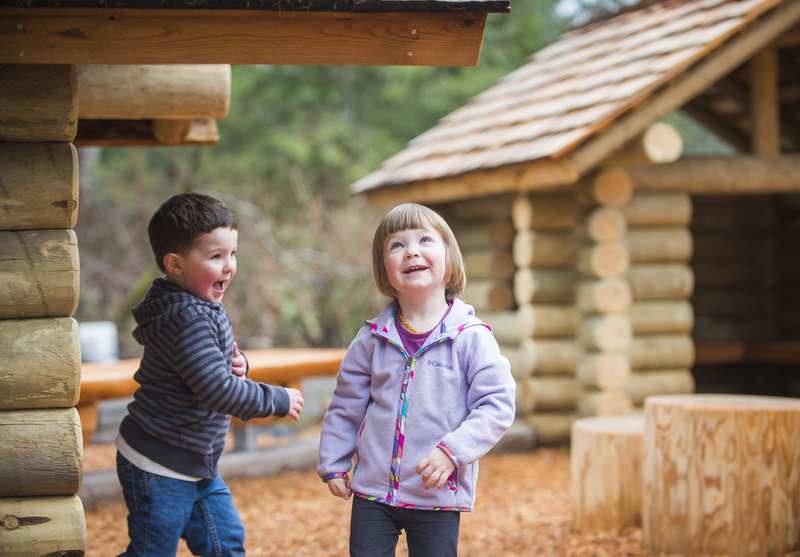 The Kids' Trek outdoor play area features a 20-foot-tall hollow tree trunk to climb, three slides, a stream with a play beaver dam, a sandy area to dig in and toddler-sized log cabins. It's ADA-accessible and open to children of all abilities. Entry to the playground is included with regular paid admission to Northwest Trek and is free for members. Northwest Trek's mission is to showcase and study species native to the Northwest and their habitats. The park features an open-range zoo exhibit where visitors travel by tram to view resident animals living in a 435-acre open area. Each of the playground's features has a specific purpose, education curator Jessica Moore said in a statement. For example, kids can follow a series of animal tracks, including those of a wolf pack seemingly in pursuit of elk tracks. This activitiy prompts kids to think about predators and prey. Sticks and branches encourage tinkering and building. Staff also plan occasional visits to the playground from the park's "Discovery Cart," a mobile collection of kid-oriented science activities. 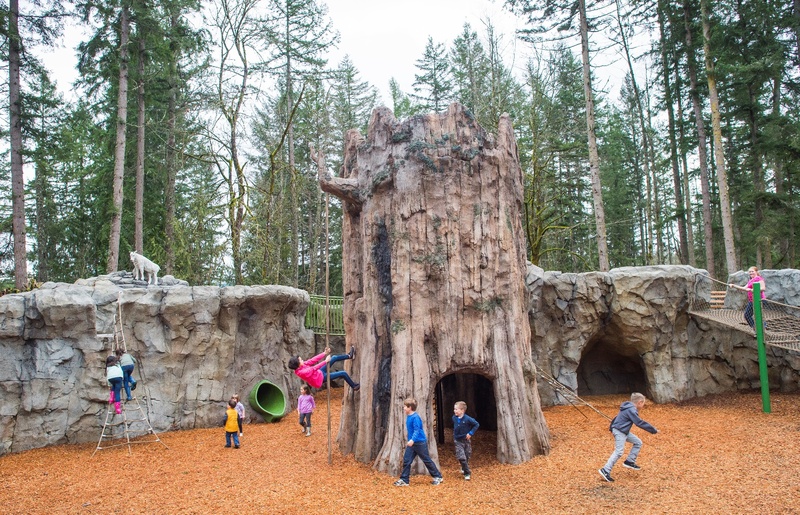 Kids' Trek holds its grand opening celebration on Saturday, April 2, with a ribbon-cutting ceremony at 10 a.m. At 11 a.m., the park will hold its first Wild Day of Play, an hour-long story and craft time designed for children ages 5–12. Wild Days of Play are planned for the first Saturday of the month through September. Check the website for dates and themes; no reservations for Wild Days of Play are required and participation is included with admission. 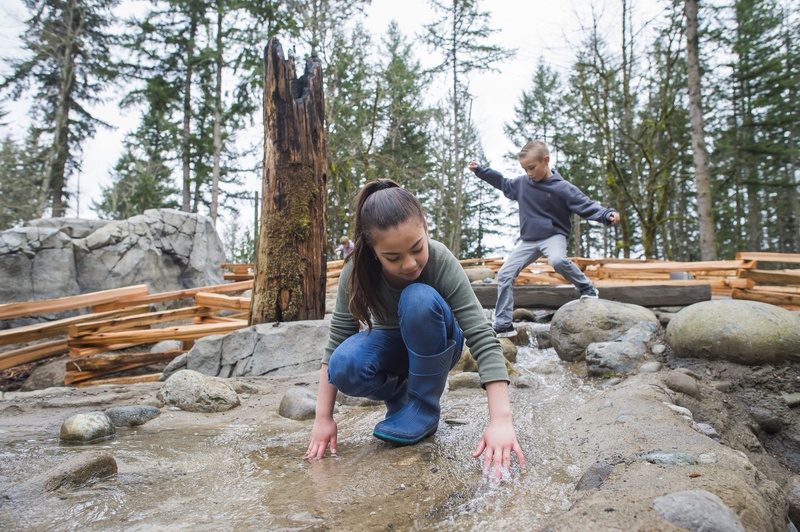 In addition to climbing, swinging and sliding through the new playgournd, a highlight of a visit to Northwest Trek is the Discovery Tram tour through the park's free-roaming area. This 50-minute, naturalist-narrated ride gets visitors up close and personal with the animals in a unique way. Tram passengers might see a trumpeter swan gliding on the lake, goats leaping in the meadow, or deer grazing on the hills. The animals are free to roam through the area, and every season at Trek offers something different. Spring is the time to see baby animals. In addition to the tram ride, visitors to Northwest Trek can walk forested trails to see a grizzly bear, two black bears, wolves, foxes, a cougar, Canada lynx, river otters, a beaver, fishers, owls and other Northwest critters. Northwest Trek celebrated its 40th anniversary in 2015. For more information on many other fascinating features of this park, read our Insider's Guide to Northwest Trek. Cost and hours: For spring, Northwest Trek is open Monday–Friday, 9:30 a.m.–4 p.m., and weekends 9:30 a.m.–5 p.m. Check website for changing seasonal hours for summer, fall and winter. Admission to the park is $23 for adults, $15 for youth ages 5–12, $11 for ages 3–4 and free for ages 2 and under. Members of the military and Pierce County residents receive a $2 discount from regular prices. Kids' Trek playground is included with admission. Location: Northwest Trek is located at 11610 Trek Drive E. in Eatonville. It's about a 50-minute drive from Tacoma, an hour from Olympia and 90 minutes from Seattle or Bellevue. There is lots of free parking. Tips: Pets (except service animals; see policy online), sports equipment, smoking and alcohol are all prohibited. The park is fully-ADA accessible; contact park staff ahead of time with any specific questions. Some activities are offered seasonally; check carefully on Northwest Trek's website for availability during your planned visit.